During the Community Built Association Conference in Davis, CA, community members, boot camp participants, and conference attendees helped in five community projects lead by community built association members, Tom Arie Donch, Donna Billick, and Caryl Yasko. Tom Arie Donch and Donna Billick lead community members in creating four benches made of concrete, mosaic, and ferrous cement. Caryl Yasko lead groups of community members in painting a mural in a local bike tunnel. All projects highlight and celebrate Davis’s diverse wildlife. The benches and mural can be found behind the Whole Foods in Davis, on the bike path that goes underneath the railroad tracks. 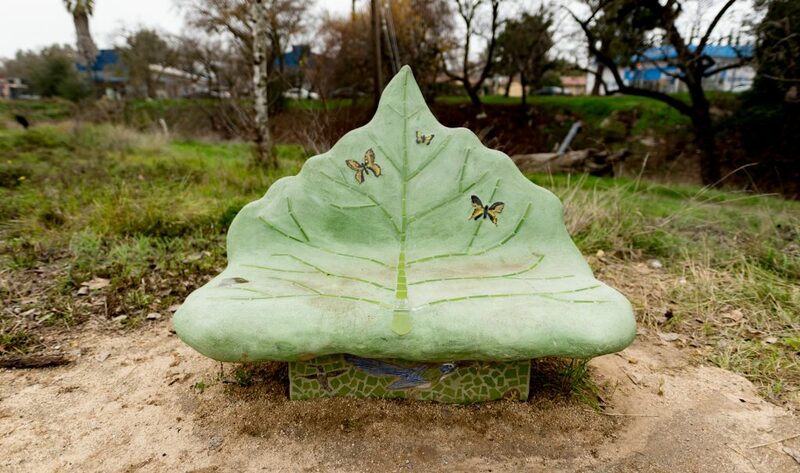 During the project, Amanda Larson assisted Donna Billick and community members in creating a ferrous cement/mosaic bench of a cottonwood leaf.